Click the button below to add the ORIENTATION TO BEADS & JEWELRY FINDINGS to your wish list. 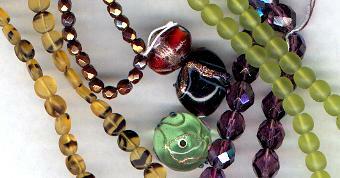 Before beginning a course of study, students are required to take our ORIENTATION TO BEADS & JEWELRY FINDINGS class. This is a required first course, regardless of the students previous beading or jewelry making experiences. The Orientation class takes about 2 1/2 hours. We offer this class once each month, typically on a Saturday morning. It does not matter if we have only one student or several -- we teach this class in either case. In this class, we cover information and insights about Materials, Techniques, and Design Concepts. These are things not typically found in books or on-line, yet critical to learn to be successful in beading and jewelry making. This course is taught at Be Dazzled Beads. The purpose of this course is to introduce the student to a common language and understanding of beads, jewelry findings and tools that they will be working with. There are no fees for these classes. No supplies, tools, books or materials are needed. Students are asked to preregister at least 1-2 days ahead of time either online, or by calling 615/292-0610. This class is typically offered once each month, typically on a Saturday morning from 9am-11:30am. Warren shared a great deal of knowledge in this class. The information was helpful as well as interesting.